Learning from the Bayesian perspective can be described simply as the modification of opinion based on experience. This is in contrast to the Classical or “frequentist” approach that begins with no prior opinion, and inferences are based strictly on information obtained from a random sample selected from the population. An Internet search will quickly provide evidence of the growing popularity of Bayesian methods for data mining in a plethora of subject areas, from agriculture to genetics, engineering, and finance, to name a few. However, despite acknowledged advantages of the Bayesian approach, it is not yet routinely used as a tool for knowledge development. This is, in part, due to a lack of awareness of the language, mechanisms and interpretation inherent in Bayesian modeling, particularly for those trained under a foreign paradigm. 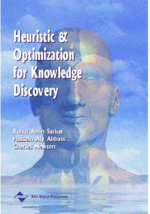 The aim of this chapter is to provide a gentle introduction to the topic from the KDD perspective. The concepts involved in Bayes’ Theorem are introduced and reinforced through the application of the Bayesian framework to three traditional statistical and/or machine learning examples: a simple probability experiment involving coin tossing, Bayesian linear regression and Bayesian neural network learning. Some of the problems associated with the practical aspects of the implementation of Bayesian learning are then detailed, and various software freely available on the Internet is introduced. The advantages of the Bayesian approach to learning and inference, its impact on diverse scientific fields and its present applications are identified.